We have tripods from Velbon, Slik and Manfrotto to suit everyone, from small lightweight tripods for compact and video cameras, to Heavy duty tripods for Pro SLR or Medium format cameras, we have Alloy tripods, Magnesium tripods or Carbon Fibre tripods for all uses. Material Aluminum Max. Height 146.6 cm Min. Height 3..
Load Capacity 6 kg Maximum Height 162 cm Folded Length ..
Material Aluminum Max. Height 156 cm Min. Height 44 .. MAXIMUM LOAD 5.51 lb (2.5 kg) MAX HEIGHT (24° LEG ANGLE) W/COLUMN EXTEND.. 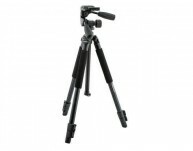 Carbon Fibre Tripod Kit Material Carbon Fiber Load Capacity..
Travel Tripod Material Aluminium Colour Black Max. Lo..
Material Carbon Fibre Colour Black Max. Load 12 kg Min. Height &nbs..
Material Carbon Fibre Colour Black Max. Load 14 kg ..